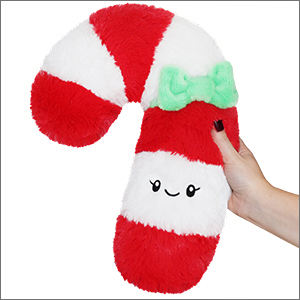 Mini Comfort Food Candy Cane: An Adorable Fuzzy Plush to Snurfle and Squeeze! Who invented candy canes? Trick question, no one knows! We do know they were around for quite a while before anyone thought to add stripes (talk about a white Christmas)! In fact, the candy cane didn�t start off as a cane at all! It was just a candy...stick! Anyway, all that�s great, but what we�re really interested in is how to concoct a striped, hooked, totally modern candy cane... out of fluff! Mission accomplished. Take that, culinary history!